Sridevi, India’s first female superstar, passed away in Dubai on the night of 24 February 2018 in her room (no. 2201) at the Jumeirah Emirates Towers Hotel. She was taken to Rashid Hospital in Dubai and was declared dead upon arrival. Her body remains at the General Department of Forensic Evidence (GDFE), Dubai, since 2.30 a.m., Sunday. Boney Kapoor, Sridevi’s husband and filmmaker, was called to the Bur Dubai police station for interrogation as the they found the death of Sridevi suspicious and Boney happens to be the last person whom she talked to or met prior to her death. Following a thorough investigative grilling of 17 hours, Kapoor was released but the paperwork is still in the process. Kapoors are expected to get the clearance certificate today. Sridevi who flew to attend his nephew’s (Mohit Marwah) wedding celebrations was left with her sister Srilatha to spend some quality time. While her husband Boney Kapoor and daughter Khushi flew back to Mumbai to attend the birthday bash of an entrepreneur and friend, Manmohan Shetty. 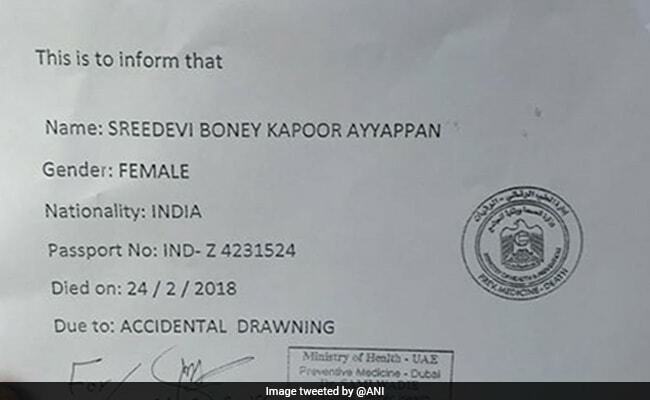 Boney Kapoor returned to Dubai again to give her wife a “surprise dinner” and found her dead. Another news which surfaced in this case was that Sridevi didn’t leave her place for 48 hours and it was highly unlikely of her as reported by her family. It is important to note here that Boney first told that he knocked at the door after fifteen minutes of her stay in the bathroom. He then knocked and broke in when no one answered. He found her dead in bathtub when he entered. In another statement he told that he called Sridevi many times from hotel lobby when no one answered, he requested the hotel security to check on her. And when hotel security entered they found her body bloated and floating. Despite the fact that Anil Ambani, an Indian businessmen, sent his personal 13-seater jet right away to bring Sridevi back, her mortal remains are still in Dubai. As the developing situation post her death is dubious and demands many questions to be answered. Fist of all, there are four versions of her death which surfaced since February 24, 2014. The top anchorperson of Pakistan, Mubasher Lucman, highlighted these points in his program Khara Sach of 26 February 2018. She died of sudden cardiac arrest. She was on prohibited-diet-pills which caused a heart attack. She consumed alcohol, went in to take bath and drowned in bathtub. Lately, she underwent multiple cosmetic surgeries. One of those operations went wrong, led to complications and she died. Her autopsy report surfaced on February 25, 2018 which revealed that she died by accidental drowning. This report in itself creates many suspicions as autopsy reports do not mention words like accidental etc. Autopsy reports do not determine the situation in which a person dies but only the cause of death. Ideally, it should only mention “death by drowning or cardiac arrest”. The word “accidental” added to the report determines that there is no criminal activity behind this death. Another important point here is that the very word” Drowning” is wrongly spelled as “Drawning”. Would forensic authorities make such a childish mistake? According to UAE’s Gulf News, “Sridevi was under the influence of heavy alcohol dose in her hotel room when she lost her balance, fell into the bathtub and drowned”. On the contrary, according to her friends and colleagues, she never touched hard-drinks. She was a very health conscious lady and never resorted to such activities. Keeping in view of the cardiac arrest theory, the statement of Sanjay Kapoor; his brother-in-law and actor, given to Khaleej Times is important, “she had no history of heart ailment and we are completely shocked”. Following the release of autopsy report, the Dubai police started probing the unstable circumstances of the actor’s death. According to many media reports, police is trying to reconstruct the sequence of events leading up to her death and have questioned those accompanying her in her final few hours, including her husband—the most important suspect. In the meantime, Indian Emissary to UAE, Navdeep Suri, ascertained the media and Sridevi’s family that the Indian embassy was trying hard to send Sridevi’s body to India at the earliest. “Our embassy and consulate are working closely with local authorities to expedite the return of Sridevi’s mortal remains and also keeping Kapoor family apprised. It is our endeavor to send mortal remains of Sridevi to India at the earliest, ” Suri explained to ANI. Her body has been sent to embalming to the AL Muhaisana embalming unit and will be repatriated to Mumbai once all the paperwork and investigation are finalized. Important to note here that Dubai paperwork is extremely complicated and tedious. ” Our experience in similar cases tells us that it does take 2-3 days to complete processes,” Navdeep Suri tells the media. Another important yet creepy tweet of Amitabh Bachan, the co-star of the late actress, sends chills to our spines as if he saw it coming. The tweet left the Twitterati wondering if Bachchan had the premonition about her death! Just 20 minutes after this eerie premonition, Sridevi was pronounced dead. Barkha Dutt, an Indian journalist, wrote an article yesterday mocking the Indian media for maltreating the case of Sridevi with utmost insensitivity. She rightly said that along with the obituaries of Sridevi we should also have obituary of Indian media which lacked journalistic rigorous to handle the tragic death of a legend, Sridevi. #RIP Sridevi for being so beautiful and iconic. You will be missed for so many reasons.